On March 9, 2013, Bernard Hopkins (54-6-2 with 32 KOs), then 48 years old, broke the world record for the oldest boxer to win a world title. Whose record did he break? His own. On April 19, 2014, the self-proclaimed Alien will step into the ring to set yet another world record. 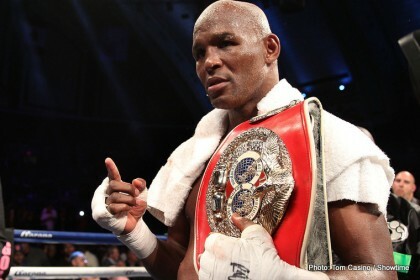 Bernard Hopkins will fight to become the oldest boxer in history to unify two major world titles. His opponent is Kazakh lawyer-turned-pugilist Beibut Shumenov. In a sport filled with unique and inspiring backstories, Shumenov’s stands head and shoulders above the rest. As a child, Shumenov was inadvertently poisoned by his aunt. As his parents took their blue, shriveling child to the hospital, they were informed that their boy would not survive. Doctors managed to save the boy after running an IV through his skull. Subsequent to these life-saving measures, doctors told Shumenov’s parents that he would always be small and that he should avoid physically taxing activities. The 6’2” WBA Light Heavyweight Champion has spent a lifetime proving that those doctors were dead wrong. In his 30 years on this planet, Shumenov has gone from begging relatives for food to becoming a millionaire attorney and a champion fighter. After losing in the 2004 Olympics, Shumenov felt he had let Kazakhstan down. The depressed boxer ate himself to 230lbs, but eventually came to his senses and entered the professional ranks. He moved to Las Vegas, NV, a holy land of sorts for professional boxers. He spoke no English and knew nobody. Today he speaks five languages and is known throughout the world. Bernard Hopkins is a living legend and one of the smartest fighters in any weight class. Hopkins always knows where he is in the ring. He stays aware of which side of the fighters the referee is standing, and exploits the opposite side with any shots he can get away with. He is perhaps the best worldwide when it comes to ring generalship, and knows how to fight to win a decision. Hopkins is 2-0 since his majority decision loss to “Bad” Chad Dawson. He has beaten Antonio Tarver, Winky Wright, Kelly Pavlik, Roy Jones Jr., and Jean Pascal. However, this list only includes fighters he has beaten in his 40’s at Light Heavyweight. In his 30’s, Hopkins fought a hall-of-fame worthy career at Middleweight, unifying the titles and successfully defending them against Glen Johnson, Felix Trinidad, and William Joppy (not to mention his crippling liver-shot knockout of Oscar De La Hoya). Time is the unavoidable enemy of fighters and fathers alike. Like any man, Bernard Hopkins is getting older and will not fight professionally forever. Shumenov’s biggest advantage over Hopkins is his age. Specifically, that Shumenov is much younger than Hopkins. However, the last Hopkins opponent who did not have an age advantage was Simon Brown, who Hopkins defeated back in 1998. Prediction: Hopkins by Unanimous Decision. Bill Barner is a former USA Boxing Judge and a former sparring partner for several amateur and professional fighters. He currently practices law for BarnerRossen PA in South Florida.